Sometimes dinners need to come together super quick and require minimum fuss and minimum washing up. One pot dishes are ideal for during the week when time, and probably also your patience, is at a premium. This super quick spanish style potato hash is thrown together in a matter of minutes and packs plenty of flavour. 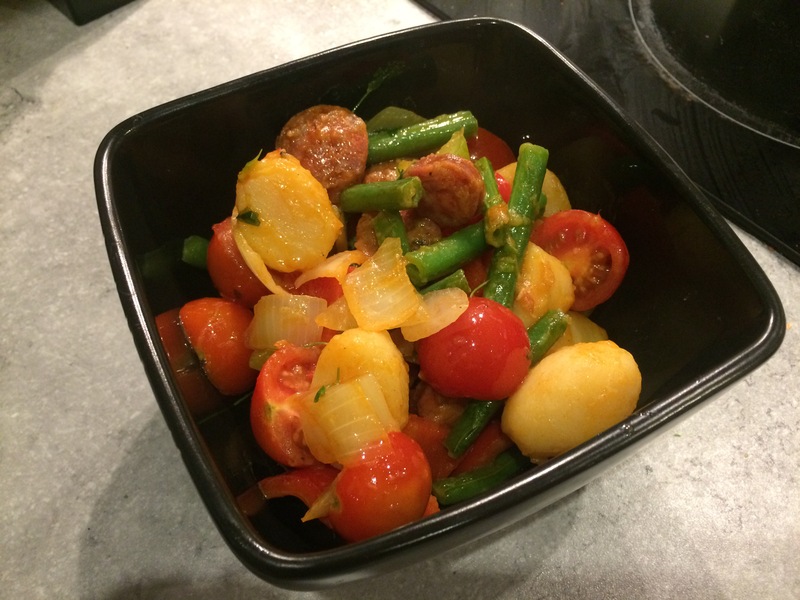 Chorizo is one of my favourite ingredients to add to a simple dish to really amp up the flavour. Tinned potatoes are not an ingredient I’ve use before and I really don’t know why not. I guess I could have easily boiled some potatoes alongside cooking the vegetables and added them to the dish, but that would increase both washing up and my prep time. Whilst I do object slightly to buying those packets of potatoes that have already been chopped and had butter smothered all over them (because they cost twice the price for an added extra that you could easily do yourself and wouldn’t cost as much), tinned potatoes canned in water do not have any nasty or unnecessary additives and don’t cost a fortune, in fact they’re really cheap. The 800g can I bought from Sainsbury’s was a thrifty 80p. I was first inspired to try using tinned potatoes by Jack Monroe. I’ve been trying to be a bit more cost-conscious with my weekly shops to keep our spending down post Christmas (also because we need to buy a new sofa)! Jack Monroe is the ultimate inspiration for thrifty cooking. Tinned potatoes feature in many of Jack’s recipes and Jack is well known for keeping the cost down and working on a tight budget since their days of living below the poverty line and trying to feed a family on £10 a week. If you’ve not read or heard of Jack’s blog before, it’s a great read, dealing with food poverty, politics and many social issues, they’re an inspiration to many, not to mention a dab hand in the kitchen. 1. In a large pan or wok, heat a little oil and gently fry the chorizo until it starts to release it’s own oils. You will see the colour of the oil changing to a reddish/orange tone. 2. Add the green beans and continue to fry for a couple of minutes until they begin to soften. 3. Add the potatoes and mix thoroughly allowing them to become coated in the chorizo oil. 4. Add the rest of the vegetables and continue to fry until the onions are cooked. 5. Throw in the cherry tomatoes and allow to cook just long enough for them to warm through and start to ooze a little juice. Season well with salt and pepper and a generous squeeze of lemon juice. Separate into bowls to serve.